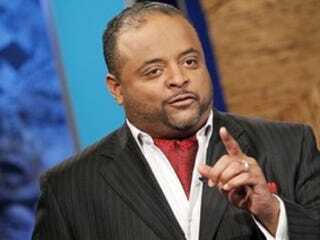 Roland Martin: Mocking Soccer or Sexuality? CNN's Roland Martin was heavily criticized and labeled homophobic by followers and gay-rights groups after tweeting last night that people should "smack the ish out" of male fans of Super Bowl commercial starring David Beckham. Martin, who's a proilific tweeter in addition to his role as a political analyst, wrote that "real bruhs" would not purchase underwear advertised by the soccer player. The Huffington Post reports that gay-rights group GLAAD tweeted a response to Martin, saying that "advocates of gay bashing have no place at @CNN." The activist group went even further and has now called for CNN to fire Martin, saying his statements were "part of a larger pattern for Martin." The organization also criticized a tweet Martin sent earlier in the day, in which he made fun of a New England Patriot player who arrived wearing a pink jumpsuit. "He needs a visit from #teamwhipdatass," he wrote. Can we chalk this up to a misunderstanding, or was there truly something troubling behind Martin's tweets? Let us know in the comments.